Principled Technologies ran an online transaction processing workload on two configurations of a Dell EMC PowerEdge R740xd server. The configuration that used NVDIMMs processed more transactions per minute than a configuration that relied on SATA SSDs alone, which could help businesses handle a larger volume of user requests. Handle even more customer requests using the Dell EMC PowerEdge R740xd with this memory upgrade. 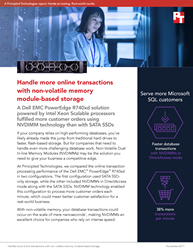 Businesses that need to serve even more customers with their Dell EMC PowerEdge servers may consider using non-volatile memory to speed up transactions. To learn more about how NVDIMMs could improve online capabilities, read the full report at facts.pt/zNbAUU.